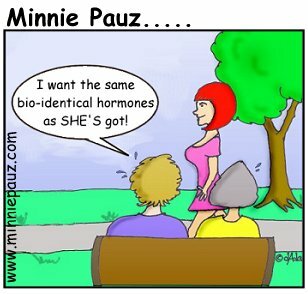 minniepauz.com - Bio-identical hormones. Are they really? You are here: Home // Reading The Minnie Pauz Blog // Bio-identical hormones. Are they really? We have Oprah, Suzanne Somers, Christiane Northrup and even Dr. Phil's wife, Robin McGraw on the bio-identical bandwagon, but we're still as confused as ever and I personally feel there is still pressure to sell us (middle-aged women) some very expensive drugs that are being hyped as the fountain of youth! At least one of them is a doctor (Northrup), but honestly, you can always find equal numbers of doctors, scientists and researchers who either agree or disagree with the safety and the efficacy. I wanted to laugh when the opposing doctor in the audience stated that the drugs you get from the compounding pharmacy (she doesn't accept the bioidentical term) are not monitored by the government, so you don't know what you're getting and if it's safe, etc. The laughable part was because of the 20+ years that the FDA was in bed with the pharmaceutical industry and pushed Premarin and Provera on women like it was candy, saying it would "make you feel like a young woman again"! How is that any different than people saying bioidentical hormones can help a woman get her quality of life back? companies started demanding that the compounding pharmacies not be allowed to do what they've been doing all along--creating prescribed, individualized doses of hormones for women. I actually tend to trust what Suzanne Somers says because I can see that she has done the research and does use everything herself. She clearly states that her regimen is not for everyone, but she is proof that she's doing something right if she feels as good as she says she does. She certainly looks good at 62. And so does Dr. Northrup, but I'm pretty sure both have had some kind of cosmetic enhancements. Although I do appreciate that Oprah is about the only one who can get the world focused on menopause, I wonder sometimes why she brings certain people as an example of one side of an issue? At least Northrup is a doctor, but even she has used cosmetic surgery to enhance her looks. The other guests (McGraw and Somers) have also had "some work done" and yet, are we supposed to see them as examples of what bioidentical hormones can do for us? All three of them have the money to get whatever it takes to look good. The bioidentical hormones are very expensive and most insurance companies don't cover them yet. Of course, for the millions of women who don't have insurance, ANY of hormones are expensive! Just going to the doctor and getting the prescription is out of their reach. What I'm seeing now after 12 years of talking to women on my website (www.minniepauz.com), is that we are much more informed these days and we're taking control of our healthcare. We're making decisions based on our own research and family history and we're possibly taking on the risks for a chance at a better quality of life. I continue to refrain from taking any hormones based on the continuing confusion offered by our medical advisors. If they cannot come to some kind of reliable, cohesive conclusion about what women should do, then we just have to make the decision for ourselves. The sad part is there doesn't seem to be any organization willing to study ALL of us to find out if it was all a bunch of hype or if bioidentical hormones are any better. We continue to be "guinea pigs" for society when it comes to keeping women safe. Liked what I read. I have felt that way for a long time. This is to the last sentence. The rest of the article is good too.